fab´rik: Noun. A fancy way of spelling the English word fabric. Lowercase, on purpose, with an accent to emphasize the first syllable. (It’s a branding thing!) Rhymes with stick, not creek. If you’ve ever walked into a boutique and felt invisible or out of place, you are in for a pleasant surprise at fab´rik , one of the hottest women’s clothing stores to arrive on the scene at Shelter Cove Towne Centre on Hilton Head Island. The franchise lives and breathes the corporate motto: “High style with heart, no attitude or sticker shock,” as established by founder Dana Spinola, who set out to create a high-end boutique experience without the high price tag. 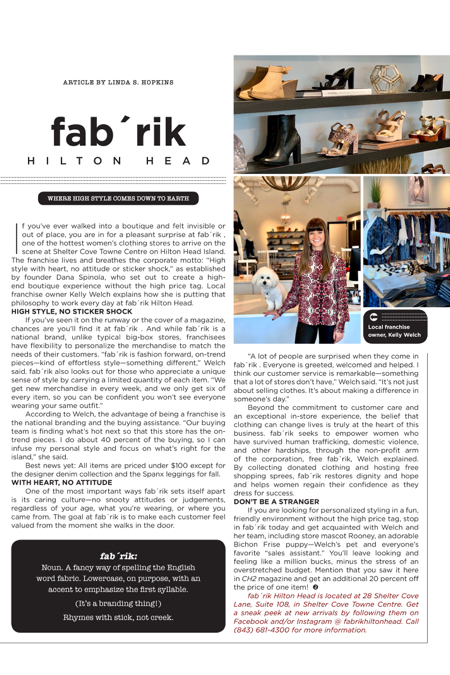 Local franchise owner Kelly Welch explains how she is putting that philosophy to work every day at fab´rik Hilton Head. According to Welch, the advantage of being a franchise is the national branding and the buying assistance. “Our buying team is finding what’s hot next so that this store has the on-trend pieces. I do about 40 percent of the buying, so I can infuse my personal style and focus on what’s right for the island,” she said. Best news yet: All items are priced under $100 except for the designer denim collection and the Spanx leggings for fall. One of the most important ways fab´rik sets itself apart is its caring culture—no snooty attitudes or judgements, regardless of your age, what you’re wearing, or where you came from. The goal at fab´rik is to make each customer feel valued from the moment she walks in the door. Beyond the commitment to customer care and an exceptional in-store experience, the belief that clothing can change lives is truly at the heart of this business. fab´rik seeks to empower women who have survived human trafficking, domestic violence, and other hardships, through the non-profit arm of the corporation, free fab´rik, Welch explained. By collecting donated clothing and hosting free shopping sprees, fab´rik restores dignity and hope and helps women regain their confidence as they dress for success. If you are looking for personalized styling in a fun, friendly environment without the high price tag, stop in fab´rik today and get acquainted with Welch and her team, including store mascot Rooney, an adorable Bichon Frise puppy—Welch’s pet and everyone’s favorite “sales assistant.” You’ll leave looking and feeling like a million bucks, minus the stress of an overstretched budget. Mention that you saw it here in CH2 magazine and get an additional 20 percent off the price of one item! fab´rik Hilton Head is located at 28 Shelter Cove Lane, Suite 108, in Shelter Cove Towne Centre. Get a sneak peek at new arrivals by following them on Facebook and/or Instagram @ fabrikhiltonhead. Call (843) 681-4300 for more information. Breast Cancer - You Are At Risk, But Are You At High Risk? For Director Casey Colgan, Anything Goes in ANYTHING GOES!